The Phoenix Snowbirds arrive every October, and leave in April. If you're not familiar with the term Snowbird, it's a slightly playful, slightly negative term for a winter visitor to Phoenix, Arizona. Locals use the term, and winter visitors use it until they find out the slightly negative connotation. Of course if you understand the economy of Phoenix, you know that it relies on winter visitors, and has for over 100 years. The economic health of the valley is dependent on tourism, and people love to come there in the winter, as the winter climate is one of the very nicest on planet earth. There's bright sunshine, warm temperatures (not hot! ), crystal blue skies, and well, it's just nice. Real nice. And people leave their dreary snowy climates to come out and bask, and play golf, and go to restaurants, and to just generally enjoy. And that means a LOT of money for Phoenix! If you have a business that relies on winter visitors, you know that. If you're like most people in Phoenix, just trying to get to work, dealing with traffic, etc., you're not very happy about winter visitors, and you call them Snowbirds. My parents, pictured at the top of this post, were Snowbirds for many years. From the time that my dad retired, until my mom's mother died, they kept two households - one in Minnesota, and one in Phoenix. At first they rented an apartment in Phoenix, which had been specifically designed for Snowbirds, being furnished with everything down to dishes, and then they moved into a trailer park (oops, mobile home community). They Snowbirded until my mom's mother died, and then they sold their place in Minnesota, and stopped being Snowbirds. I suppose at that time you could call them "Desert Rats", like I am. The Snowbirds never see Phoenix in the summer. And as much as I love living here, I gotta admit the summers are terrible. If I could afford it, I'd have a mountain home, and be a Snowbird myself. But I'm a Desert Rat. I've seen a lot of summers, and they start in April. The heat really doesn't let up until in October when the Snowbirds return. And in April they fly away. 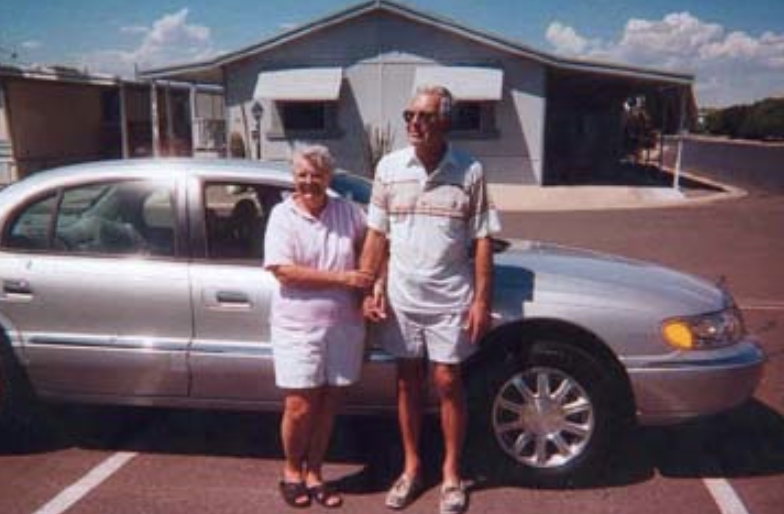 Photo at the top of this post: My parents in 2001, when they were Snowbirds, in their Mobile Home Community at 91st Avenue and Grand, Peoria, Arizona.